Between starting my degree program and finishing up my studies at the Mandarin Training Center, I had about two years of non-class time to try and get myself ready for a degree program. This was probably one of the hardest transitions I had to make in my journey; that is, from formal classes to my own informal studies. Of course, this blog grew from those experiences, but for a beginner on that path, where’s a good place to start? After moving on from a language school or program, where do you go from there? What can you do when finances run thin and affording language courses and other resources seem like a far off dream? How do you keep studying and improving? The best thing to do is have a language learner’s toolbox with the best resources available to get studying. The nice thing is, many of them are free or only require a small investment to get started. 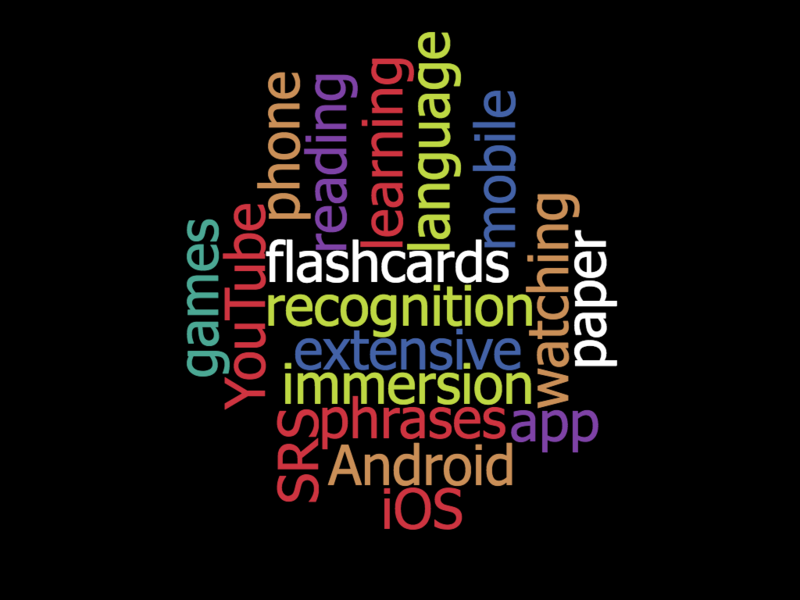 I’ve mentioned it before, but Anki is probably the best known and most accessible (being available for so many different platforms) that it is the best choice for a language learner that wants to access their flashcards from anywhere. With AnkiWeb, which keeps your cards living in the cloud, it’s even easier. There are other great (and free!) options out there–such as Mnemosyne–which is a lightweight SRS I used for quite a few years. Unfortunately it doesn’t sync and you’re pretty much stuck using a computer with it (although there is an Android version available, but reviews aren’t promising). For either tool, there’s plenty of decks available online you can download. But, building your own is a great way (perhaps even the best way) to start, by adding vocabulary and sentences you want to learn in a format that works best for you. One nice thing about either iOS or Android is the ease with which you can change the language used throughout the system. This gives you the ability to surround yourself in the language using a device that’s pretty much ubiquitous in daily life. This can vary by device, but in general you can follow the steps below to change the language on your Android phone. Go to Settings > Language & Input > Language > Pick the language from the list and your device should now show in that language automatically. Go to Settings > General > Language & Region > Phone Language > Pick the language from the list and tap Done. The phone will restart with the language of your choice displaying! Like the OS on your smartphone, switching the language on your computer is a great way to keep immersion going in your daily routine. Listed first because it is probably the easiest, getting MacOS to display in a different language is a pretty quick and painless process. All you need to do is go to System Preferences > Language & Text > Languages. In this list, drag the language to want to see used in the menus and dialogs to the top of the list. Windows is unfortunately a bit more tricky to get it to display in different languages; but it is actually really easy if you have Windows 10 where it is (finally) built into the system. Here’s how to change it. Go to the Start Menu and find Settings, then go to Time & language. Once there, select “Region & language from the left pane and click “Add a language” in the right pane. In the new window that opens, find the language you want and click on it. It will start to download. Going back to the Time & language screen, you should see the language you just installed. Click on it and choose “Options”. In options, click Download to download the language pack as well as the keyboard for the language. Finally, to set the language as the default display language, click on the language you added again under Time & language, then choose “Set as default”. It should show text under it saying that it will display the language on next sign in. Sign out and back in and you should now have Windows 10 displaying in that language! Linux, like MacOS, is pretty easy to get into a different language. These instructions apply mostly to Ubuntu, but should work similarly in other distros. Open up System Settings > Language Support > Install / Remove Languages and check the ones you want to install. It will download and install them. Once done, you can drag and drop the languages in order of preference for menus and windows, and just move them in the order you’d like. Click “Apply System-Wide” when done and, once done, sign out then back in again and you should have the system displaying in your chosen language. To really make the tools effective, you’ll want to surround yourself with the language as much as possible–building out your own language immersion environment. Here’s some suggestions. One great way to find free resources online is to compile a list of your interests (movies, music, actors, etc), and after head off to Google and Wikipedia to find the Chinese names for those items. I also looked on app stores to see if any of the video games I had downloaded for iOS had Chinese translations. I also went and found top 10 lists for music in the genres I liked, then looked for those artists on YouTube. Great bonus tip: often times they have videos with subtitles for Karaoke, really helps out when you’re learning! A simple Google search of [term]中文 will get you a lot of great results. With so many classic games being released on iOS and Android, many of them now come with multiple languages. All you need to do is switch the system language (see above) and you’ll get a localized version of the game! As I mentioned in a previous post, I’ll be working on providing some suggestions for news, music, and TV shows to watch. You can always start with dramas, but there’s also plenty of news and TV shows you can find just by Googling around (or even Baidu if you’re familiar with some names you want to look up). There’s also YouKu and Tudou as well, which has a plethora of Chinese TV shows, movies and other videos you can watch. For a great list of keywords to search for, check out this blog post. It can be a bit difficult to find good paper resources for Chinese reading materials, but luckily there’s more and more these days. Yesasia has always been a standby of mine, and you can find plenty of materials online through them at reasonable prices. Head here for their Chinese manga selection, and here for there Chinese book selection. Amazon also has a few books here and there, but it can be a bit spotty finding something good. Overall there’s a lot of great resources out there to start building up your own immersion environment, and most of it is just a quick online search away. Is there any I missed or any you’d recommend? Let me know in the comments below!